Blackthorn Focus produces publications and events for financial markets professionals, companies and their investors. ALPHA Investor Forum, the Blackthorn Focus event comprising a series of presentations from expert investors and quoted companies, will next run on March 26th at New College, Oxford. "Since the inaugural event on June 2016, ALPHA Investor Forum has created a strong brand and following . It enjoys increased popularity among dedicated stock market investors" said David O'Hara, Founder, Blackthorn Focus. "I look forward to delivering another successful event at world-famous New College on March 26th." November 12th will see a new Blackthorn Focus event, AIM Shares for Business Relief. The event will be hosted by Charles Stanley and sponsored by Progressive Equity Research. The December 2017 edition of AIM Prospector, the Blackthorn Focus publication dedicated to AIM-quoted companies, went live in December. "Top Pick this time around was Zytronic", said David O'Hara, Editor. "Only 25 AIM-quoted companies have delivered eight or more years of dividend increases. Zytronic is one." UK Smallcap Showcase, the corporate access event from Blackthorn Focus, will next run on the evening of October 11th, 2017 at the offices of Octopus Investments. Two quoted companies are scheduled to participate: Creightons and Volvere. To contact Blackthorn Focus regarding the event and for more information on the companies participating, see the apply page here. ALPHA Investor Forum, the dedicated investor conference, will run again on June 27th at Churchill College. David O'Hara, Founder of Blackthorn Focus said "ALPHA Investor Forum has already established a first class track record. The average return on companies that presented at the last event is +48%, less than one year later. The three AIM portfolios that I presented are up 39%, 73% and 31% respectively." 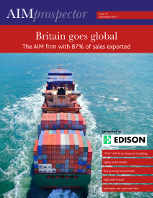 The November edition of AIM Prospector, the Blackthorn Focus publication dedicated to AIM-quoted companies, went live earlier this month. "This month's Top Pick is Colefax Group", said David O'Hara, Editor. "You don't have to look at AIM too long to find fascinating, successful companies and Colefax is certainly one."